There are many parameters that affect the taste of tea such as the amount of leaf, water temperature, teapot used and steeping time. To make an 8 ounce (250 ml) cup of tea, use the following chart as a guideline. The best is always trial and error to suit your preferences. Note : This brewing parameters serve as a general guideline only. We recommend that you try different brewing parameters according to your personal preference and taste. 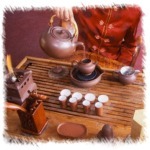 What water temperature is suitable for brewing chinese tea? Different tea types have different water temperature requirement. Tea is only as good as water. We recommend using non-chlorinated water for brewing tea, especially for subtle green and white teas. Chlorinated tap water destroys the flavor of tea. For hospitality establishments, we recommend using a carbon block water filter system which gives water a pH level of slightly over 7 or with bottled spring water to yield more satisfactory results. What kind of teapot should I use? Different teapot is used to brew different types of tea. Please refer to our chart at Classification of Tea. What is the recommended steeping time? This is probably the most personal parameter in brewing tea, it really depends on how much leaves do you use and how strong you like your tea. Therefore, the best suggestion we can offer is to start by trying the tea with short steeping for the first brews and increase the time if necessary. The table below gives you a general guideline of the steeping time for each type of tea. This step removes any dust from the leaves and opens them up to release the tea's aroma. Add enough dry leaves to the teapot to fully cover the bottom of the teapot. Pour hot water over the tealeaves and immediately pour this water into the wastewater bowl or draining tray. Remove the lid and savor the aroma of the leaves. Does the way in which tea is brewed affect the quality that much? Yes. The best tea in the world can be ruined by improper brewing.